Earning a Battle Efficiency “E” or any departmental “E” is never an easy task. To begin with, you must complete all required inspections, and exercises. Once you have met this requirement, you are then in competition with the other ships in the squadron for the covenant award. Squadron awards the E based on the scores of the various exercises and inspections. The “E’s” are awarded on a yearly basis, painted on the appropriate positions, and carried for that year. If consecutive awards are earned, this is signified by hash marks under the “E”. 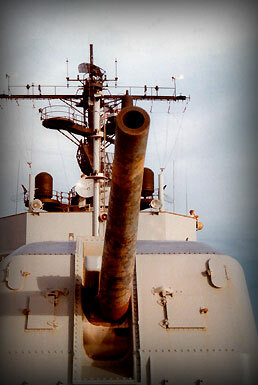 When I reported aboard DAVIDSON for the first time in early ’71, the Mk.56 Gun Director, and Mt.51 and Mt.52 sported the Gunnery “E” with two hash marks, indicating three consecutive awards. 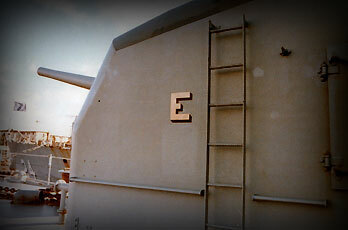 During the two years I was aboard (’71-’72) we continued to win the Gunnery “E”. It was also during this period that the DAVIDSON was also awarded the CHIZAK award. This award, which is rotated between the Atlantic and Pacific Fleets, is given to the ship that has attained the highest score in Naval Gunfire Support exercises. I’m sure that also entered in the computation for our Gunnery “E”. The awarding of the fifth “E” sort of presented a problem for 2nd Division. The fifth “E” required the painting of a gold “E” vise another hash mark. 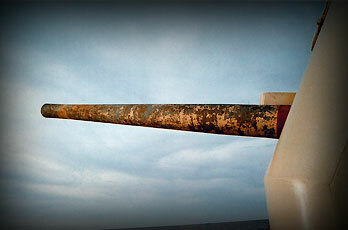 As we soon found out, gold paint was not carried in the Navy supply system and Capt. Wheeler wanted a gold “E” UP NOW!!! Back then there was not a Lowe’s or Home Depot on every block in Honolulu. If I remember correctly, I had to send one of the FT’s out to find some gold paint somewhere – anywhere!! The Gunnermates had too much work to do – as usual. I believe we found some spray paint at an auto parts store. We couldn’t just paint over the white “E” since the spray paint wouldn’t cover the white good enough. Besides, we had to remove all the hash marks also. We took the area around the “E’s” on the director and mounts down to bare metal, primed the area, and put up the Gold “E’s” – all under the watchful eyes of Capt. Wheeler. When I left the Davy in mid ’72, they were still up there. Jump ahead to August 1976. I reluctantly reported back aboard the DAVIDSON once again, this time as a Chief Firecontrolman. The gold “E’s” were still in place, this time with two gold hash marks. I inquired about the “E’s” and was informed that since the DAVIDSON was the only ship that was ever award a Gold Gunnery “E”, the powers that be determined that she would keep the Gold permanently. We continued to win Gunnery “E’s” during my next three years so that when we had an additional five awards, we also had a problem. How do you display two Gold “E’s”? You don’t. Presenting the problem to Desron11 ( I believe we were in 11 at the time), they “researched” the problem – whatever that means. They came up with the idea of painting a Silver star above the Gold “E” indicating the award of a second Gold Gunnery “E”. Needless to say, explaining this display to various personnel on the waterfront was an ongoing effort. No one had ever seen a single gold “E” displayed in any department let alone two. I believe our gold “E’s” are something we can all be proud of. Remember, this represents a minimum of ten years effort of the whole crew. Without the Engineers we would never had made it to our exercise areas. Without Ops, our navigation would never had put us in the right area to rate our high scores in Naval Gunfire Support. Without Supply we would never had the parts we needed to keep the firecontrol gear and gun mounts working, and the gunnery crews fed. As in all things aboard DAVY, it was an ALL HANDS effort. 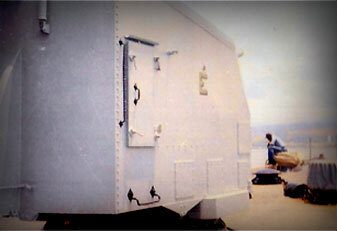 I left the DAVY for the second time in 1979, reporting to FLEET TRAINING GROUP, PEARL HARBOR. I wasn’t allowed to ride DAVY since she was a former command, and I might had shown favoritism during her underway training. I lost touch with whatever happened to her awards. I would like to think that they’re still on the director and mounts, sitting on her underwater mooring site. Pat Stroud FCCM (SW) Ret.